A major housing development in Stapleford and Great Shelford is being offered online by an Essex developer. The development on Green Belt is being touted by Essex company Scott Properties. Read the full 22 page proposal for 180 new homes in Stapleford Cambridge here. Sir John Sulston was made a Companion of Honour, “for services to science and society" in the Queen's birthday honours in June 2017. Sir John, who lives at Stapleford, Cambridgeshire, was director of the Sanger Institute - which was then called the Sanger Centre - from 1992 to 2000, where he played a major role in the Human Genome Project, set up to map human DNA so that researchers can find ways of tackling major illnesses. Companions of Honour were created in 1917. There can only be 65 members. Others people becoming Companions of Honour in the 2017 birthday honours were Sir Paul McCartney, Harry Potter greater JK Rowling, designer Sir Terence Conran and TV cook Delia Smith. Sir John Sulston was awarded the Nobel Prize in Physiology or Medicine in 2002. Read a profile of Sir John here. Major changes are taking place at Stapleford Granary in Stapleford near Cambridge. Local architects Moses Cameron Williams have provided a plan which will see the buildings at Stapleford Granary lovingly restored in order to maintain the character whilst offering an open and welcoming space. A centrepiece of the design is a glass walkway connecting the Granary to the main entrance and refurbished barn. It will be a space which will act as a foyer/informal meeting area, and will in the summer months can be opened onto a terrace, shaded by a wisteria covered pergola. The barn will be transformed into a new low energy office space, whilst the ground floor of the Granary will provide further creative spaces for music and the arts. There will be much improved visitor facilities and access, with space to relax and enjoy refreshments when attending a course or event. A handbag has been stolen from a car in Stapleford, Cambridge. Between 5:45 pm and 7:45 pm on June 9, on Gog Magog Way, Stapleford, the rear windscreen of a car was smashed and a handbag stolen from inside. Between 10:30 am and 1:30 pm on June 9, someone scratched down the side of a vehicle parked in Bar Lane, Stapleford..
Proposals have been published to bulldoze the Tree and build a new pub and two homes on the site. An artist's impression is published on the left. You can read the full planning application here. The Tree Action Group said in April that they had raised £130,000 of their initial £150,000 target to save the Tree which closed in 2013. The decision regarding a compulsory purchase order takes place in October. The Action Group has set up a Facebook page - https://www.facebook.com/thetreestapleford/, Instagram - @thetreestapleford, and Twitter - @TheTreeStaplefd - to keep everyone up to date with progress, and to garner more support. Two burglaries took place in Hawthorne, Road, Stapleford between 9:20 pm and 10 pm on May 9. The thieves conducted an untidy search of both premises before making off with a number of items. Two men were seen making off from one of the properties and leaving in a black BMW 3 series vehicle. The first male is described as being around 5 foot 7 inches tall, Mediterranean or Hispanic ethnicity and aged between 21 and 40. The second male is described as being around 5 foot 9 inches tall, Oriental / South East Asian ethnicity and aged between 21 and 40. Both males were dressed in all black clothing. *In the third burglary a house in Church Street, Stapleford which is undergoing renovation was entered sometime between May 12 and 15 and a quantity of building tools were stolen. Stapleford School is hoping to raise £180,000 for new premises for the Out of School Club. The Out of School Club (SOOSC) is so successful that all its places are full and the waiting list is ever increasing. The Club needs to expand substantially to meet demand. But in order to make this possible, the Club needs a new home. The Club is currently based in the Community Room in the school’s playground. Unfortunately, Government ratios limit the number of children it can have in the Community Room to 20. As an interim measure, the School is currently running an extra after school club for Key Stage 1 children, which provides another 10 spaces in the main school building. The Club committee and staff and the School are working together to find the best long term solution for the club and its children. They have set up a Community Task Force with the PTA to look at how and where best to house the Club so that it can double its capacity. There are several options on the table at present, including a new brick built building or a modular one. They are also looking at merging the two existing clubs and bringing SOOSC and its staff into the school. “This is an exciting, positive and necessary project: but it will involve a lot of work, and above all a lot of fundraising. Initial estimates suggest we will need to raise £180,000,” said a letter from the Task Force. Stapleford has two new county councillors after the elections on May 4. Conservatives Roger Hickford, who lives in Little Shelford, and Kevin Cuffley were elected. Roger is the Deputy Leader of the County Council. Sunnyside pre-school playgroup is closing at the end of May. Financial reasons have been blamed for the closure. Sunnyside had 30 children attending before Easter. That number is now down to 22 as parents are finding alternative arrangements. See the Sunnyside website here. Read the latest Ofsted report for Sunnyside here. Councillor Wright from SCDC spoke and said that, in his opinion, it is clear that The Tree is a community asset. The decision regarding a compulsory purchase order takes place in October. 83 pledges have been received totalling £130,500 as at 22 April 2017. £150,000 is the total amount we can obtain in pledges. We have successfully applied to the Financial Conduct Authority (FCA) for incorporation as ‘The Tree Community Limited’, the Plunkett Foundation has accepted our application for grant funding and we have, in principal, agreement to take out a bank mortgage. The business plan was outlined including start-up costs and sources of initial funding. This clearly demonstrates the financial viability of a re-opened public house including accommodation and catering facilities. An important note raised was that we have applied to HMRC for Advanced Certification for the Seed Capital Enterprise Investment Scheme (SEIS) - this allows investors to claim back 50% of contributions from their personal income tax paid (2nd tranche EIS should attract 30%). Note - care if purchase does not go ahead, tax benefits lost. We have received a grant of £1,000 from the Parish Council and a bursary of £2,500 from the Plunkett Foundation to assist with initial costs. We are very grateful for this support. Pub is The Hub and the Plunkett Foundation spoke about the work they do and how they support this campaign to save The Tree. They were both very upbeat about our campaign, emphasising that The Tree really is worth ‘fighting’ for and could be a great community asset. The Action Group has contacted leisure and sports groups in Stapleford for their opinions. We have received 14 positive responses to date, indicating they would use the venue for their committee meetings, social events and for the accommodation. We are working with a Cambridge designer on a logo that can be used across lots of media for future promotion, leaflets, menus etc. A new website is also being professionally developed. We have set up Facebook - https://www.facebook.com/thetreestapleford/, Instagram - @thetreestapleford, and Twitter - @TheTreeStaplefd - to keep everyone up to date with progress, and to garner more support. The Action Group will continue to speak to community organisations to establish their level of support, we are strengthening our communications and publicity strategy and we are trying to increase the number of financial pledges from individuals. Stapleford will have two new county councillors after the elections on May 4. Do you have experience of Human Resources in a medium to large size organisation? Are you a member of our local community, who would like the opportunity to gain a valuable insight into how the College operates whilst sharing your skills to progress and advance the school for the future? Would you like to be part of a team that is shaping and driving improvement in the education and experiences of young people in our community? Sawston Village College is seeking to expand the skill-base and capacity of its Local Governing Body. If you possess expertise in the areas of Education, Finance, Business Enterprise or Safeguarding, and would be interested in joining our Governing Body as a Trust Governor, please contact the Clerk to the Governors via the email link below. Local independent business Literature Cambridge presents study days at Stapleford Granary, with inspiring lectures and stimulating discussion led by Cambridge academics. These courses are challenging, yet accessible. No prerequisites: just a love of reading. Stapleford could soon have its own village hub. The Parish Council will soon will soon submit a planning application to extend the Slaughterhouse to provide a museum facility, meeting room and clerk’s office turning it into a village hub. "Last year I said that ‘The village will grow in the next 4 years but we will do our best to keep you informed’," Parish Council chairman Nigel Pett is expected to tell the Annual Parish Meeting. "That is what the extension can do – provide a communication centre for the village. " The Annual Parish Meeting takes place at the Jubilee Pavilion on April 12. Read the Chairman's full report here. The area inside Hinton Way, Bury Road, Haverhill Road and London Road will be made a 20mph zone later this year. The proposal came from Stapleford Parish Council. Cambridgeshire County Council has agreed to pay most of the costs of the changes. The re-opening of The Tree pub has come a step closer. South Cambs District Council have said they will now consider a compulsory purchase order for 'The Tree' as an Asset of Community Value - i.e. as a pub, cafe and community hub. So the campaign group would like to know how people in the community value 'The Tree' as a congenial meeting place. How might you and your friends use 'The Tree'? 'The Tree' would provide suitable refreshments during the day and the evening, and, there is an outside area (e.g. for barbecues). It would also provide overnight accommodation. Answers will be collated into a report for the SCDC when they consider the purchase order. The ACE Foundation at the Stapleford Granary is growing. Building work will take place in the summer. The changes include development of its venue and study centre. They are the second phase in the ACE Foundation's vision to create an inspiring space providing educational activities and events for all ages. Stapleford Granary is already a thriving space for a diverse range of performances, workshops, lectures and courses. The next step will allow an even greater programme of events and provide improved visitor facilities, including an increase in capacity for the main recital hall, together with enlarged foyer and refreshment areas. A centrepiece of the new development is a glass walkway connecting the existing main performance space to the upcoming development. Building work will commence in summer 2017 and will be completed in time for the ACE Foundation to celebrate 60 years since its founding in 1958. The nineteenth-century buildings were formerly part of the historic Bury Farm in Stapleford. During the construction, a limited programme of courses and events will continue at Stapleford Granary. Locally grown Mothers' Day bouquets are available on our doorsteps in Stapleford. Cathy Marchant has been working locally as a gardener for about 15 years. She started growing flowers to sell 4 years ago. "I grow a huge variety of seasonal flowers which I sell to event florists, to brides who want to arrange their own flowers, as gift bouquets and I do a small number of wedding myself," said Cathy. "I also sell bunches of flowers at Shelford Deli. For Mothers Day the deli will be stocking special bouquets on Friday and Saturday. You can also pre-order Mothers Day flower bouquets directly from me. They will be full of all British grown scented Spring flowers. For more details look on my Facebook page The Midnight Garden Flower Farm. "There is a blossoming interest across the country in buying locally grown flowers -we currently import 85% of the flowers bought in the UK." Stapleford History Society is planning the next big archaeology dig over the weekend of 20 - 21 May. It's time now to get signed up, so we can plan for how many sites we can dig, and set up the volunteer teams. This is your opportunity to get down and dirty with your neighbours, and find out what's hidden under Stapleford's lawns. Children, adults, families: all are welcome. Prior experience isn’t required; training and equipment are provided. The more people who can spare a couple of hours or more over the weekend, the more we shall be able to discover. To join the team for 2017, or to find out more, contact Debbie Stearn on 845806 (e-mail adrian.stearn@sky.com), or John Street on 842627 (e-mail john@streetfam.co.uk). Lyn Pepperell from Stapleford has come 3rd in the whole of South Cambridgeshire in the Village Hero community awards. Lyn was one of a number of people honoured at the ceremony on March 9.
is cutting back the shrub and undergrowth so that it can be restored to a rare chalkpit meadow. Already around 75 wildflower species have been recorded since 2015, when the group started, which falls short of previous totals, records starting in 1992 but it is very encouraging. If you would like to join one of our work parties which are held monthly, then come to the Pit which is nextdoor to the Magog Down on Haverhill Road. Park in the Magog car park and walk back down the road towards Stapleford. You will see a signpost to the pit alongside the lane to Gog Magog cottages. Our next work party will be on March 31st from 9.15-12pm. Bring strong gloves, secateurs if you have them and a drink. All other equipment will be provided. A tree blocked the cycle path to Sawston for four days. The tree blew down during Storm Doris on February 23. The tree made headlines in the Cambridge News. The bin collection day in Stapleford changed to Tuesdays from February 28. The waste collection service is being shared between South Cambridgeshire Council and Cambridge City Council. 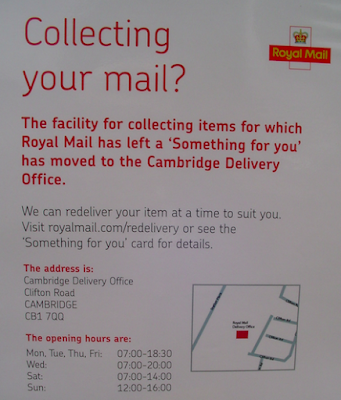 The 'old' Post Office at High Green Great Shelford closed on Thursday 2nd March. The 'new' Post Office at the Kash Stores, Hinton Way opened on 7th March. Green Groups in the Shelfords, Stapleford and Sawston held a very successful Repair Café in Great Shelford at the end of January. Over 40 items were seen, most of which were repaired or the problem diagnosed and advice given – the feedback from both repairers and ‘repairees’ was very positive. We are holding another Repair Café, this time at Sawston Free Church, from 2 – 5 pm on Saturday 25 March. You can turn up with your broken item on the day, but we expect to be very busy so it’s best to book it in at www.repaircafe.org.uk/southcambs and get an idea of when we will have a free time slot. The repairers are brilliant and can fix most things but there are no guarantees. Tea and cake available of course! After that our next event will be a talk and discussion evening at Little Shelford Village Hall at 7.30 pm on Thursday 27 April entitled: ‘Five Transport Myths about Cambridge(shire) – can you even guess what they are?’. Jim Chisholm, perhaps best known as a local cycling campaigner, will explain. We shall also hear from Nigel Brigham, who did the investigation for the ‘Greenways’ Report on future local walking and cycle ways (Sawston is one of the villages included for consideration). Do you enjoy singing? We are a friendly group of men and women who meet weekly in Stapleford to sing popular songs from days gone by. Two men - one armed with a tyre iron and the other wearing a skeleton face mask – robbed the Spar shop in Stapleford and escaped with £500. The robbers entered the shop on London Road at about 8pm on Saturday, January 14, and told the cashier to empty the till. About £500 was placed into a bag before the men ran off along London Road towards the Rose Public House. One of the men man was as described as stocky and 6ft or taller. He was wearing blue jeans, dark trainers, a grey hooded jacket and leather gloves with a scarf partially covering his face. The other man was wearing a skeleton face mask and gloves, dark trousers, black trainers and a dark hooded jacket with white pull cords on the hood. Anyone with information is asked to call DC McKeane on 101, or Crimestoppers, anonymously, on 0800 555 111. An application has been made to change the speed limit from 30 to 20mph along Mingle Lane and Church Street. Two two speed signs and poles are being purchased for the village. Shelford Cricket Club will have 3 junior Shelford and Stapleford teams (the under 11, 12 and 13’s) playing on Saturdays in the summer Stapleford. Read the full minutes of the December Stapleford Parish Council meeting here. Regarding the cycle Path Stapleford to Sawston, Mike Davies has looked into cycle safety on A1301 in December. It is an ongoing problem. The crossing from Sawston to the cyclepath was improved in 2014 and there have been no accidents since the scheme came into effect. However the number of cyclists has grown since then and there are now capacity issues. Mike is working up a system of Greenways or cyclepaths from the city to the near villages which will be funded from the Citydeal, S106 and DfT. It would look to widen the pathway and resurface it. After three exciting and successful community digs, plans are taking shape to explore more locations in 2017. Put the weekend 20 – 21 May in your diaries now! Children and adults: all are welcome. Prior experience isn’t required; training and equipment are provided. The aim is to investigate at least 30 sites, so as to build up a picture of how our village has developed. With 27 already done, we hope to complete the survey in 2017. We've found prehistoric flint, modern plastic pipe, Roman and Tudor pot, and everything in between. Collecting more evidence will help us to tell a clearer story of how people have lived here over the centuries. It all depends on volunteers: willing local residents to host archaeological test-pits in their gardens, and curious children and adults who can contribute a couple of hours to do the digging and record what we unearth. It’s not heavy work. About 60 people enjoyed the experience in 2016. If you’ve not been involved before, and would like to join the team in 2017 as a digger or a host (or both! ), contact John Street on 842627 or john@streetfam.co.uk. Villagers have been advised NOT to try to use DVDs that have mysteriously been posted through some letterboxes in adjoining villages. Two burglaries have taken place in Stapleford over one week-end. The first break-in took place in Aylesford Way, Stapleford. This occurred between Friday 2nd December and Sunday 4th December. The burglar broke in through a patio door. However nothing appears to have been stolen at this time. A second burglary was reported in Joscelynes, Stapleford. This occurred during the afternoon of Sunday 4th December. The thief broke in via the kitchen window at the rear of the property and items of jewellery were taken. The Parish Council have suggested a new home in Haverhill Road should be rejected after a resident pointed out that the area has had previous flooding problems. The Council has sent another letter to Balfour Beatty regarding the health and safety issues from areas where the streetlights have been removed. There is consideration of removing the land near the Nature Reserve of Nine Wells from the green belt to enlarge the biomedical campus at Addenbrooke’s. The Parish Council is concerned about the encroachment through the green belt towards Shelford and Stapleford and agreed to send comments about their views. A finger post is to be erected in memory of Robert Heap. Councillor Janet Howe has resigned from the Parish Council. The process of advertising a Casual Vacancy will now be started. Read the full minutes of the Parish Council meeting here. A new cycle routes been proposed between Stapleford and Cambridge. The Save the Tree group are looking to use a Compulsory Purchase Order to save the village pub. Mr Bill French gave an update from the Save The Tree Group to the Parish Council meeting in October their business plan has been well received and more financial pledges are being received. The group are talking to the Plunkett Foundation about support and are looking into a Compulsory Purchase Order. A planning application has been submitted to demolish the pub and build two homes on the site. The Parish Council voted to oppose the proposals. See the plans here. Read about the other actions and decisions at the October Parish Council meeting. Make:ECHO Model:KOMBI UNIT Description:hedge cutter and chainsaw attachment and streamer. A bumper series of events is being planned to include the show, cycling tour, cricket match, music evening with wine, bar and ceilidh with sumptuous food. Watch out for more details including a winter wine tasting evening to add to the momentum. See the village web site and social media but if you want your organisation to be involved then please attend the next planning meeting on Tuesday 29 November at 7pm in the Three Horseshoes. The thieves struck on Friday October 21st. The householder left home by taxi at 10 am and was back by 12 noon. By then, all their jewellery had been taken. A grey truck registration beginning ES62 was seen acting suspiciously in the area at the time. Please find attached a flier with the information about the scheme. I will be grateful if you can promote this web link to your community to help them save money. During the last 18 months, Cambridgeshire residents saved £230,000 from collective switching deals saving on average £224 per household. Please contact the Energy Investment Unit on 01223 728552 if you have any questions on the above or difficulties with the helpline. Two young men have been seen streaking around a car in a cul-de-sac in Stapleford. Alicia posted on the Streelife website on October 12 that she "was disturbed watching television by voices outside the lounge windows. "Imagine my surprise when I looked out to see one or two young men streaking around my car! They jumped into a small purple Nissan and drove off at speed. My cul-de-sac in Stapleford is usually a very quiet safe place so was wondering if anyone else had had a similar experience? Read the full story on Streetlife. Local people worry the cycle path used regularly by Sawston Village College children between Sawston and Stapleford is very narrow in parts and will be dark in the winter according to County Councillor Gail Kenney. The County Council plans to “sideout” the existing path from Sawston to Stapleford and to undertake hedge trimming in November to maximise the width of the path. The Council has also offered cycle training to the Village College and highlight measures which will assist cycling safety. They donate around £15,000 each year to charities and organisations serving communities in villages like Stapleford. Since 1986 they have donated over £425,000 to local hospitals, hospices, schools, youth organisations and local branches of national charities. Who makes the biggest difference in Stapleford? The search is on for the people, organisations and businesses that make a big difference in South Cambridgeshire communities including Stapleford. Nominations for South Cambridgeshire District Council’s seventh annual Community Awards celebration open on Monday (10 October), and they’re asking residents to put their community heroes forward for some well-deserved recognition. - Village Hero – for an outstanding individual’s contributions to community life. - Environment Award - for the valuable contribution made by groups who seek to improve villages for residents in the long and short term. - Wellbeing Award - for the many groups improving residents’ health and wellbeing, both mental and physical. Find more information about awards categories, and nominate online, at: www.scambs.gov.uk/community-awards Nominations close on Friday 20 January 2017. No internet access? Call Siobhan Mellon on 01954 713395 for a paper form. Awards will be presented at a special ceremony at South Cambridgeshire Hall in March 2017. Front and rear registration plates were stolen from a car parked in Gog Magog way between 8pm and 9pm on September 21st. Jewellery and watches have been stolen in a burglary in Stapleford. The break in happened between 10 am on Sept 4 and 9:50 pm on Sept 5 in Greenfield Close, Stapleford. The Burglars entered a property by breaking a window on a double glazed French door. Obstructive parking continues to cause problems around the village. Problem areas include near the church, by the Spar and by the school. The issue has been highlighted by the Stapleford Environmental Group in their annual report. "Obstructive parking has formed part of our monitoring activities, but we have been asked not to approach householders," it states. The groups achievements over the last 12 months also include arranging an extra dog bin on Gog Magog Way and applying for and we applied installing a ‘planter’ bike stand outside the Spar. A special green living event is taking place in Stapleford in September. An apple press – bring your surplus apples and some sterilized milk cartons and make yourself some apple juice. How to find the best cycling routes. Click here for more details of the Stapleford green event. Proposals for a new holiday centre in Stapleford have been rejected.